Building relationships is all about making connections, says Charles Repnow, who as sees himself as a connection maker in his role as Edgewood Vista’s life enrichment coordinator. 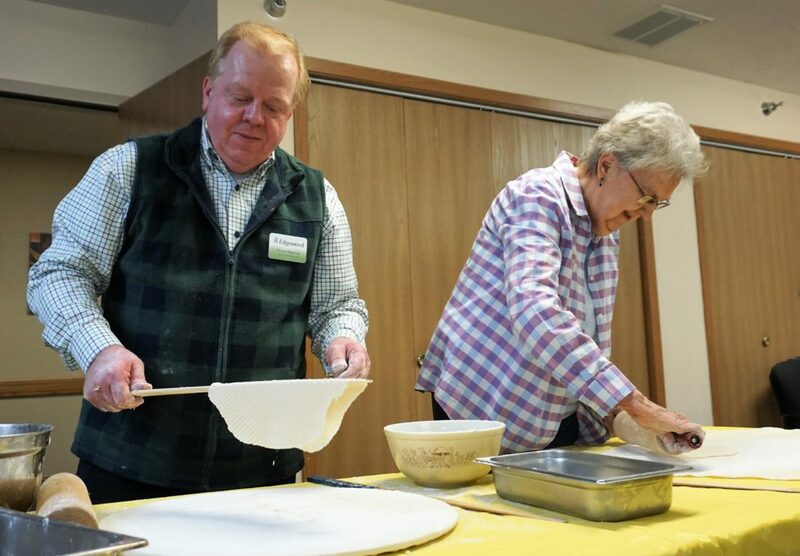 Whether it’s rolling lefse, reminiscing over high school yearbooks, showing off handcrafts or enjoying a piece of homemade lemon pie, Edgewood Vista residents are gaining opportunities to connect through activities that revive memories. Repnow said there’s many memories and interests people will find they have in common if they take the time to look, and he loves creating activities around those commonalities to bring people together. Sometimes connections exist through shared careers, colleges or hometowns, but residents may not be aware of them. “I am amazed at how many of those connections I can ‘re-connect,'” said Repnow, who has been doing so since joining Edgewood Vista last fall. He describes his job as bringing additional sunshine to the existing activities program. Along with promoting resident interaction through events that let them remember the past, he coordinates day trips in and outside the community. He also has the privilege to get to know the residents. He also finds he can learn from them. “We have a library of people who have a lot of experiences, especially in cooking. They have some really good tips,” Repnow said. His own interest in cooking, history and writing come together in his weekly “Let’s Cook” column, which runs in the Pierce County Tribune in Rugby. 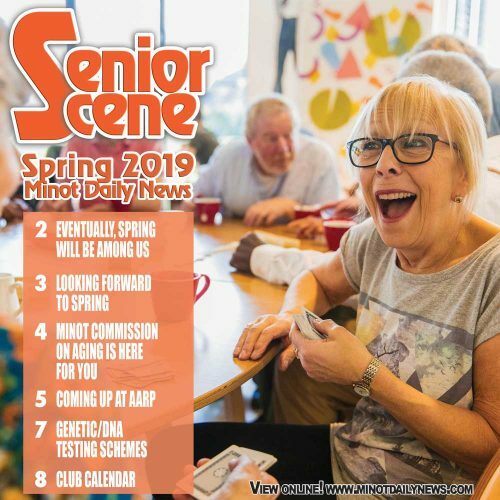 Also formerly published in the Minot Daily News, Repnow’s column has been a way to connect with older residents. His writings on topics such as the 60th anniversary of Corningware or the music of Kate Smith resonate with seniors. Repnow also writes a column in the Edgewood Vista newsletter. Repnow previously had worked independently in home care and for Prairie Rose Home Service in Minot. He had operated a photography studio in Rugby before moving back to Minot four years ago with his wife, Jan, an instructor at Minot State University, and their daughter, Lydia, now 13. Both Repnow and his wife are MSU graduates. In his years of working with seniors, Repnow often looked for ways to connect and build relationships. He would research where a client used to live and then take the client on a drive by the location to encourage the person to talk about life there. He would research a client’s former work to get to know the person and start a conversation to encourage story telling about those days. “Happiness can be found even in a changing body and mind because music, memories and poetry are the last to go. It’s the last switch,” said Repnow, who added it’s a switch he’s used to connect with elderly seniors. Reciting a familiar piece of poetry or singing an old song are surefire ways to build a connection. In many cases, he simply relates well to an older generation because he’s an old soul who shares their interests. He admits his affections lean to Lawrence Welk, silver teas and 1959 Cadillacs. He loves antiques and stories about yesteryear. Even as a child, he was drawn to older people and their life experiences. Repnow said his mother had worked as a nurse at the nursing home in Underwood, and he volunteered there to make rugs. “I really loved it. I loved the artist part of doing the rugs but I really liked connecting with people,” he said. He likes that Edgewood Vista promotes a culture of connection too. It’s those connections with employees and residents that make an assisted living center a home, he added. “When we go to assisted living, it’s really a life change because we are giving up quite a few things that we perhaps really love. But by being here at Edgewood Vista, they can still have their own place and they can take some of their things they really love. They have the opportunity to make new friends,” he said. Repnow said seniors should embrace those golden years by making the most of the opportunities to learn, grow and connect with the people around them. “Residents who do that really blossom,” he said.